“The Kiss,” taken on V-J Day in Times Square by Alfred Eisenstaedt and published in Life Magazine is certainly one of the most famous photos of all time. The photo has become a fascination, spawning wild goose chases to find the couple pictured. Their identities remain a mystery, but a newly published photo from largely unknown photographer Leonard Hellerman demonstrates that the iconic scene may not have been as singular as it appears. American Photo discovered Hellerman's shot, taken exactly 70 years ago, on August 14, 1945, in Hartford, Connecticut. 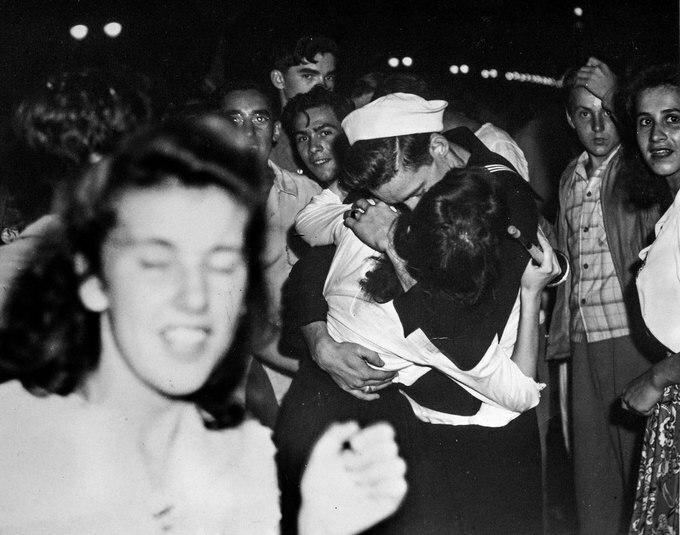 Hellerman's other insight may explain why his photo so resembles Eisenstaedt's. The couple pictured, perhaps in both photos, were not actually a couple at all. In fact, they were complete strangers. Hellerman says this behavior was common in men who had just returned from battle. “You might call him a predator this guy, or being a little more aggressive than our culture now accepts. They were just grabbing every woman around," Hellerman said.